China Buffet offers contemporary Chinese American food that ranges from classics like General Tso's Chicken (we go through 40 cases every two days) to new dishes like Peanut Butter Chicken (popular favorite). In addition, we also offer a salad/sushi bar and many of the amenities that you would find at your favorite Chinese establishment. Whether it may be bringing your Chinese food fanatics or even your little kids (we even have pizza and chicken nuggets), there will be something for every member of the family to enjoy. I went for dinner to the China Buffet Restaurant, which is located on the far east side of Green Bay. It is a humongous open concept restaurant with very bright and festive decor. As you walk in, you are overwhelmed with different bright colors and various knick knacks galore. 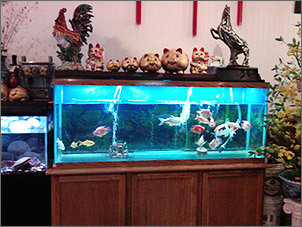 At the entrance of the door are two large aquariums, one with large gold fish and the other one contained large turtles. Everywhere you look there is something to avert your eyes to. The walls are adorned with Chinese plaques and pictures, and hung from the high ceiling are many red and gold Chinese lanterns, sea shell chimes, and a Mickey and Minnie Mouse. Cut out and taped all along the whole length of the walls are different colored Christmas bows. Scattered throughout the restaurant are gold colored glittered pigs and cats which look like banks with various small water fountains intermixed throughout. It was a very busy night and the first thing the hostess said to me was, it will be $9.00. She automatically assumed I would be ordering the buffet, but I informed her I would like to order off the menu. She was in a hurry, she gave me the paper menu and told me to stand on other side so she could quickly ring up the new customers. You pay and order your meal as soon as you walk in and don't expect any greeting or explanations here. I told her my order, which she then took my menu and with an ink pen underlined my choice. I asked her what choices of hot tea they had and she said they only have Chinese tea. Okay, I said, I will order that. She kept the menu and went on her busy way. Since it was my first time here I wondered how they would know where to bring my food to me since you then proceed to find your own booth or table with no number. As I was waiting for my dinner I saw that over 98% of the people had ordered the buffet. The buffet was massive with easily over a hundred different choices to choose from, even pizza. The women staff wore pretty Chinese red jackets and the men wore white shirts. They were constantly walking around with carts taking away extra plates from all the tables. For my dinner I ordered a bowl of egg drop soup for $2.00 and for my entree I ordered, from the healthy section of the menu, a plate of steamed chicken, scallops and shrimp with Chinese vegetables and a side of white rice for $8.99. Well to my wonder, a server brought out my soup and it was served in a plastic to go container, too funny. The egg drop soup had a light yellow greenish color, not the rich yellow color I am accustomed to; the flavor was mediocre to agreeable and the texture was not silky. A girl server then brought me my order and quickly left. My rice was spread out on a separate flat plate and to my disappointment my entree was totally void of any scallops and chicken. I tried to explain to one of the staff who was clearing off the tables, since it was hard to secure anyone else, and explained my dilemma. The hostess who took my order came to me, with the original menu that she had underlined in ink my order and said this is what you ordered. I politely said, do you see any chicken or scallops, I don't. She then looked at it and quickly took the plate away but left the plate of rice. After not too long of a wait the hostess came back with the correct order and apologized for the mistake. The seafood was fresh and nice in size and the chicken was thinly sliced and tender. The vegetables were very fresh it all tasted wonderful. I told a staffer passing by that I had ordered hot tea off the menu and she kindly told me you help yourself to tea and water at the buffet area. It was definitely an interesting dining experience at China Buffet.